Marta Marrero was born on May 18, 1969 in Whittier, California, the daughter of Cuban parents. She is a singer-songwriter and actress. Marrero entered mainstream show business in an uncredited role as one of the orphan girls in the 1982 motion picture Annie. This led to her being cast as Gloria on the long-running kids show Kids Incorporated as one of a group of neighborhood kids (one of her co-stars was Stacy Ferguson, better known as Fergie from Black Eyed Peas) who rise to local fame by singing staged productions at a corner malt shop. Martika and many fellow Kids Incorporated cast members were featured in the musical numbers from the Mr. T motivational video Be Somebody... or Be Somebody's Fool! in 1984. Following her role in Kids Incorporated and Be Somebody, Martika was signed by CBS Records as a potential Madonna-like pop star. Her first solo release, however, was released only in Japan. "We are Music" was recorded to promote Sony cassette tapes in the Japanese market, where the song was released in the 12", 7" and CD formats. She recorded two studio albums and her solo career though for a brief time, mainly due to her signature hit, Toy Soldiers. During this time she decided to juggle between her singing career and acting career. Martika played the role of the lounge singer Dahlia Mendez in the early 1990s cop show Wiseguy, opposite Steven Bauer, but the return to acting was brief and she eventually faded from the public eye around 1993. Ever since then, she has tried to relaunch her music career to no success. he built martika.net in 2001, a website for her fans, and released a remix of a newly self-recorded song called "The Journey". She also recorded a track entitled “Monday” for a new solo album which the website stated was on its way. “The Journey” had 5,000 hits as a free download on mp3.com’s music service. Eventually, however, her website was shut down, the album never materializing.Eventually she and husband Michael Mozart formed the duo Oppera, releasing two albums. In October 2009, it was announced that Martika, now going under the stage name Vida Edit, will star in the new web-based television action program J8ded, as Lolly Pop. Martika is Martika's debut album, released on October 18, 1988 by CBS Records. Stylistically the music was strictly pop, despite exploring some adult topics lyrically. The album charted to #15 in the U.S. (Gold disc) and #11 in the U.K. This album spawned the following singles: Cross My Heart, More Than You Know (#18 U.S., #15 U.K.), Toy Soldiers (#1 U.S., #5 U.K.), her cover version of Carole King's I Feel the Earth Move (#25 U.S., #7 U.K.), Water (#59 U.K.), and Alibis. 1-) If You're Tarzan, I'm Jane. 3-) More Than You Know. 5-) You Got Me into This. 6-) I Feel the Earth Move. 8-) It's Not What You're Doing. 9-) See if I Care. 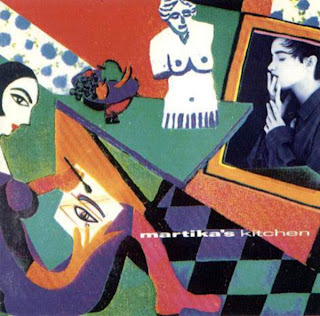 Martika's Kitchen is Martika's second and last studio album, released on August 27, 1991. It features four songs written and produced by Prince. The album was a departure in musical styles from Martika's debut album. "Martika's Kitchen" incorporates elements of gospel, jazz, funk, R&B and traditional Cuban music. The album charted to #111 in the U.S. and #15 in the U.K. The following singles were taken: Love…Thy Will Be Done (#10 U.S., #9 U.K.), Martika's Kitchen (#93 U.S., #17 U.K.), Coloured Kisses (#41 U.K.), Safe in the Arms of Love, Spirit (promo only), and her duet with Celia Cruz, Mi Tierra (promo only in Argentina). 3-) Love…Thy Will Be Done. 6-) Safe in the Arms of Love. 8-) Take Me to Forever. 10-) Don't Say U Love Me. 1000 Gracias-thanks-. Amigo ED (aunque muchos .rar stan incompletos-en otras discog... Y thanks x subirlos en -mediafire-"la mejor opción". Los enlaces de descarga llevan al Dominio comprado por otra empresa y reformado. Una perdida de tiempo! HOLA SEAN BIENVENIDOS A ESTE BLOG, ESPERO QUE SE SIENTAN EN CASA. ESPERAMOS QUE ESTE BLOG SEA DE SU AGRADO. Y POR FAVOR DEJEN SUS COMENTARIOS Y SUS PETICIONES. Hello everyone!! Welcome to this blog and please make yourselves at home. We hope that this blog is of your pleasing. Please leave your comments and requests. Hola gente!! Les recuerdo que cada disco que bajen después de que lo escuchen lo eliminen y hagan lo posible por comprarlo. Recuerden que debemos de apoyar al artista. Muchas gracias!! Hey people!! I want to remind you that every cd you listen to after you've listened to it please make the most effort to go out and buy it. Remember that we should always support artists. Thank you very much!! Travel theme. Theme images by tomograf. Powered by Blogger.